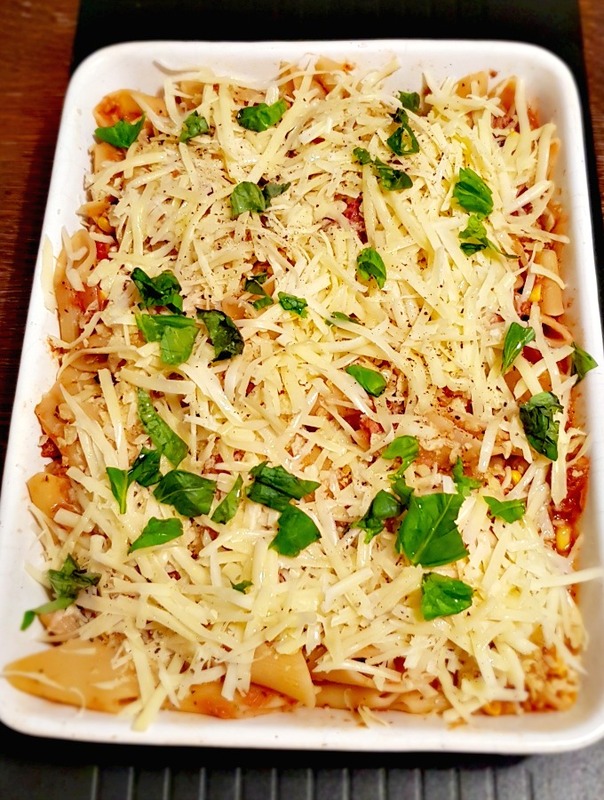 Tuna Pasta Bake is perfect for a midweek family meal, and it’s tasty, quick and is made using cheap, basic store cupboard ingredients. 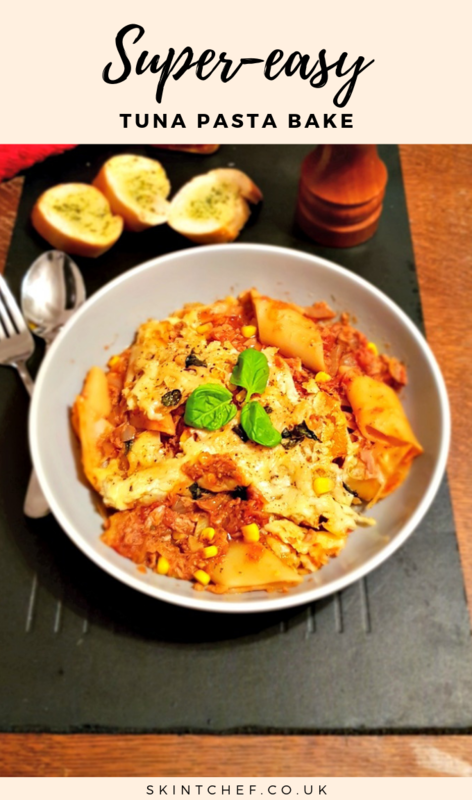 This Tuna Pasta Bake recipe proves you don’t need a lot of fresh ingredients in the house to eat well. With a few store cupboard essentials, you can make a delicious family meal in no time. 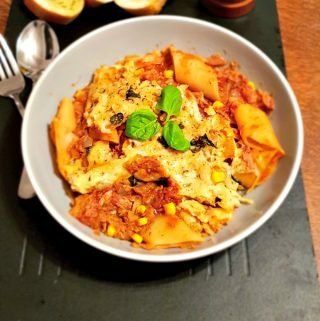 The ingredients for tuna pasta bake are staples in pretty much all store cupboards, so everyone will be able to make this quick. As well as being simple to whip together, it’s a winner with families, and they’ll be wanting it added to the meal plan week after week. The kids always get involved when making our Tuna Pasta Bake because of crisps. It’s all about destruction, and they love crunching up all the crisps and helping to scatter them over the top of the pasta bake. 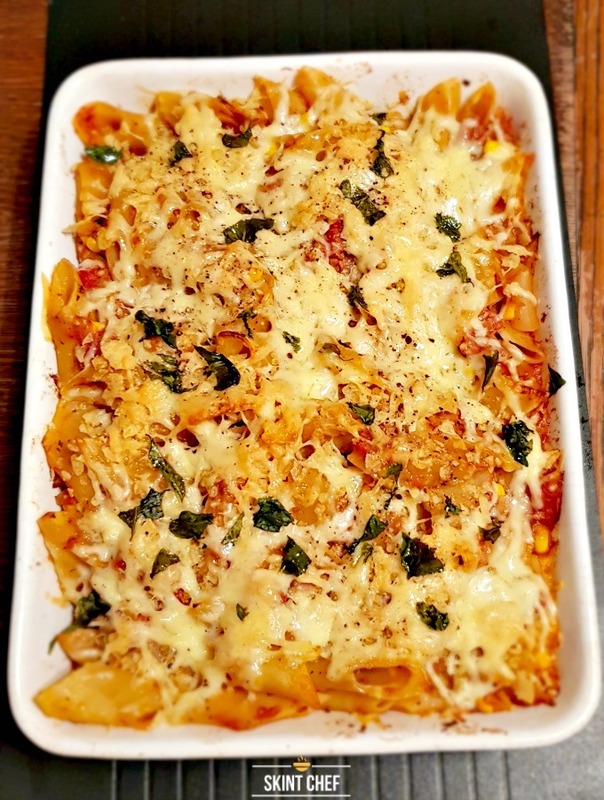 Adding a sprinkling of crisps and cheese on top give the pasta bake a golden, crunchy crust that just makes this dish! You could use put any old pasta shapes you’ve got in the cupboard. I would usually opt for penne type pasta or fusilli as they cook well and hold the coating of the pasta bake sauce. They’re also versatile and can be used regularly in other dishes. There have been many times when we’ve got half empty packs of pasta, and it’s okay to mix them up and have a variety of shapes. If you’re in a rush in the evenings and don’t have time to get dinner sorted, this is a great dish to prepare in advance. Once you’ve got everything into the oven-proof dish like this one on Amazon, just cover it up and pop it in the fridge. You can then heat it up the oven later on when it’s time to eat. It’s worth letting the dish sit at room temperature for 10 minutes before putting it in the oven if you’ve had it chilling. It should keep well for 1-2 days. 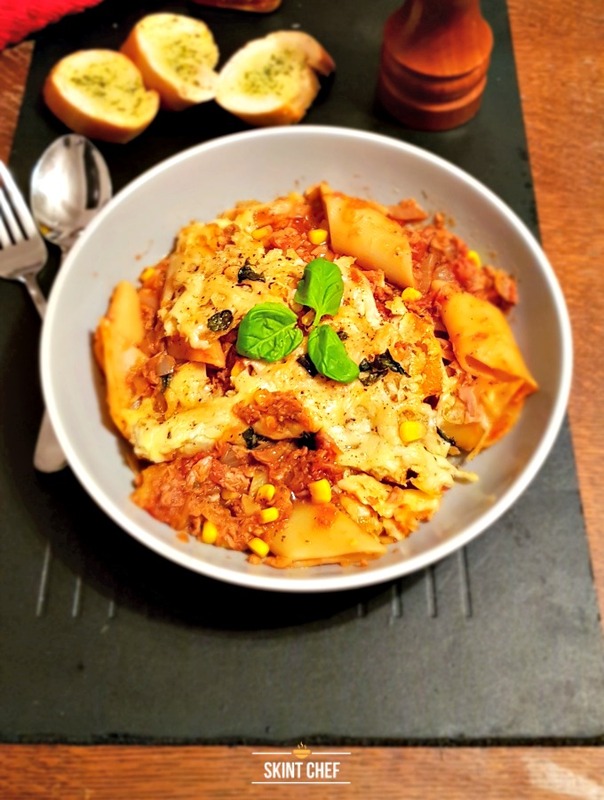 A tuna pasta bake is great served with a side salad and warm, crunchy garlic bread to help pop up the sauce. Cook the pasta for around 8 minutes until ¾ part done. Heat the oil in a non-stick pan and sauté the onions and garlic until lightly browned. Add the tomatoes and basil and cook for 15 minutes on a medium heat. Stir in the tuna and sweetcorn, then season with salt and pepper. Add the drained pasta into the pan with the tuna mix. Coat the pasta thoroughly and then transfer into a large oven proof dish. Sprinkle the crisps and cheese on top and then cook for 20 minutes on 200C on the middle shelf.